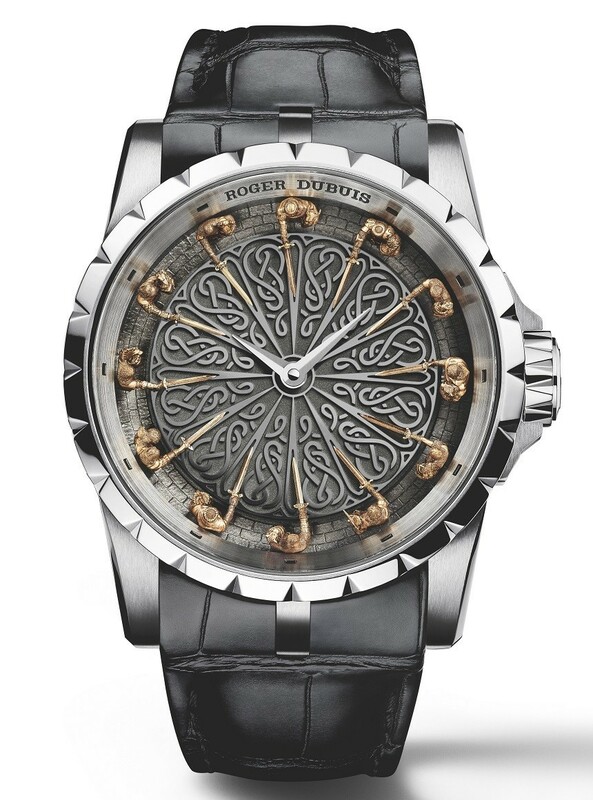 In 2013, the legend of King Arthur was the inspiration for a one-of-a-kind Roger Dubuis creation named Excalibur Knights of the Round Table. Today, in 2015, Roger Dubuis proudly introduces a new interpretation of the key values that have made this ageless legend truly universal, the Excalibur Knights of the Round Table II: A timeless legend. Masterfully engraved and laden with symbolism, this fresh expression of the Round Table legend adds even further weight to the evocative power of the piece. Legend has it that Merlin declared: «around this table, the bravest knights will gather as equals. They will set forth in search of adventure, righting wrongs, protecting the weak and humbling the proud». Thus began the adventures, as the 12 Knights took the oath of allegiance to King Arthur, swearing to spare no effort, overcome any obstacle and return triumphant. From the Middle Ages to the modern day, the universality of the legend of the Wizard and the Knights of the Round Table has remained popular. King Arthur valiantly defends his realm from his enemies and all the action takes place essentially in the mythical forest of Brocéliande. The best, the noblest and the purest of men are at his side in combat, companions whose strength of arm is equaled only by their strength of character. The story of their exploits has marked history and eloquently honored the cardinal values of strength and respect. 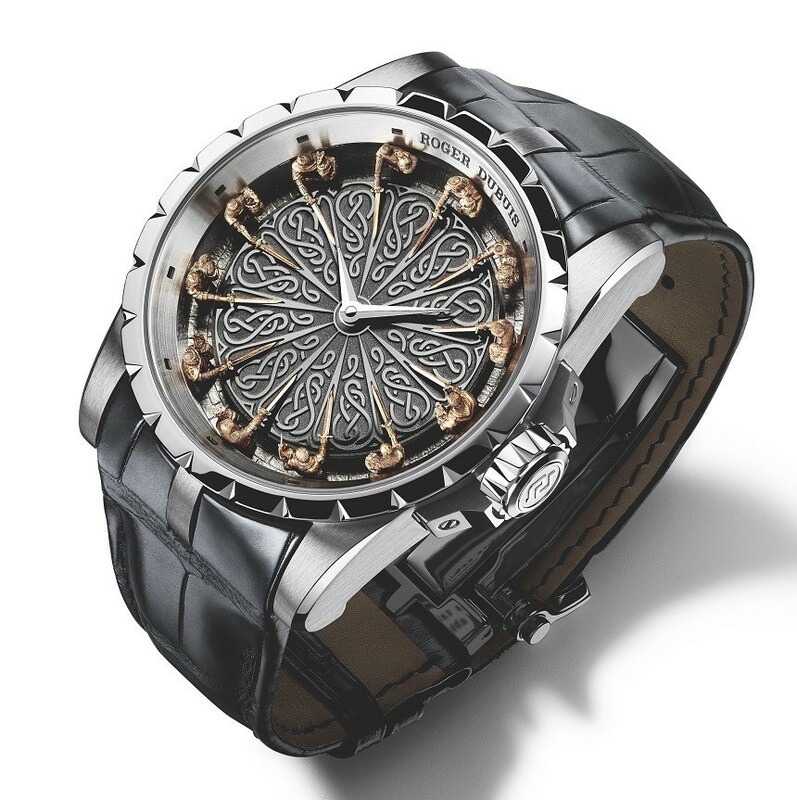 These are much the same aspirations that motivate Manufacture Roger Dubuis in its ongoing desire to make people dream and its quest for its own particular Holy Grail: the uncompromising excellence epitomized in its 100% Poinçon de Genève certification. Product Design Director Lionel Favre explains: “In this standout model, the motto of the mythical knights, ‘Courage and generosity’ reflects the Roger Dubuis approach to its craft. It is nobly represented by the artists and watchmakers working in close collaboration to create an alliance of both traditions. Boldness and steadfastness. Courage and generosity. Strength and respect. Fearlessness, rigour and discipline. These are precisely the kind of values with which Manufacture Roger Dubuis senses a natural kinship spanning the ages and which naturally find their place at the Round Table of enduring horological excellence. Older PostSunrise Ruby Sold for a World Record Record of $30.3 Million & It Has Pigeon's Blood?